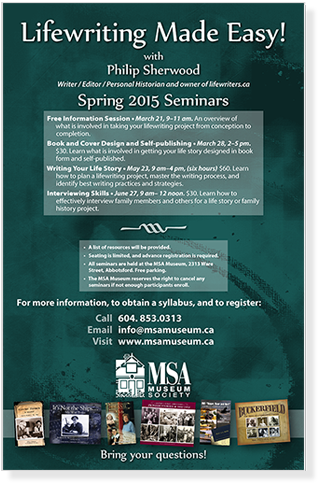 Seminars – Lifewriters.ca | Memoirs, Family Stories, and Corporate Histories : Do you have a story that is waiting to be told? You have a story. We can help you tell it. Many people wish to write their life stories themselves, but they just need some advice and direction. With this in mind, lifewriters.ca offers “Lifewriting Made Easy,” a three-part series of fee-based seminars that equips do-it-yourselfers with the necessary tools and knowledge to write and publish their memoirs: Lifewriting Made Easy, Interviewing Skills, and Book Design and Self Publishing. These seminars have been held on several occasions at two B.C. museums and received favourable evaluations. At least three participants went on to complete and self-publish their life stories. If you or your organization would like to host a lifewriting seminar, please email us or call us toll free at 1.800.864.9152.
lifewriters.ca serves clients in the greater Vancouver area and British Columbia and across Canada.